Contrary to popular perception, the term “anime” covers more than just kids with spiky hair yelling attacks. As the Japanese language’s generic term for almost any animated work, the word casts a wide net that covers everything from iconic properties like Sailor Moon to prestige period shows that wouldn’t look out of place as live-action Emmy-bait. Simply put, anime is more than its popular image. That being said, Spike Chunsoft’s adventure title Punch Line looks very much like the image that most outsiders have of what constitutes “anime”. Yuta Iridatsu, a Japanese teen, gains superpowers that cause his hair to glow bright red when activated. A vigilante heroine named “Strange Juice” prances around in a skimpy outfit and rides a futuristic motorcycle straight out of Akira, beating up baddies by night and living the life of famous pop idol Mikatan by day. Yuta’s landlady Meika is a mad scientist. A terrorist group called “Q-May” rants about an approaching meteorite that will destroy the Earth, but is being covered up by the government. Everyone in Punch Line has a secret of great consequence to hide. 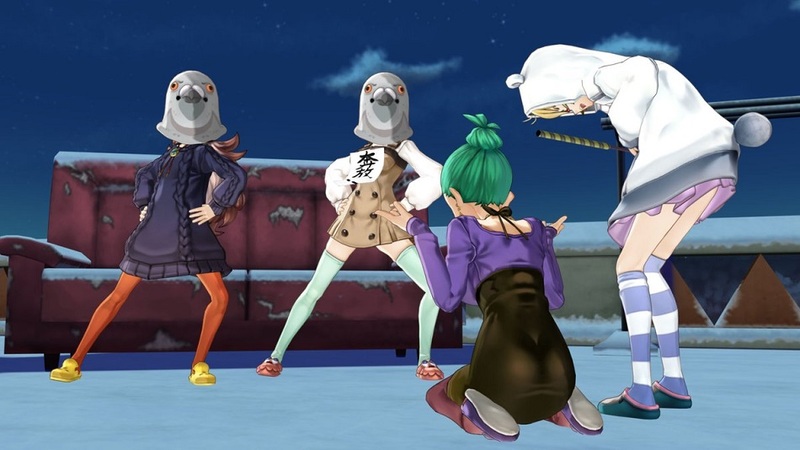 Punch Line is based on the 2015 anime series of the same name, and both productions were helmed by Kotaro Uchikoshi, the mind behind twisted franchises like Nine Hours, Nine Persons, Nine Doors, and the Zero Escape series. Unlike those works, though, Punch Line is outwardly silly and marinated in juvenile gags. Everyone’s name is a Japanese pun, and Yuta’s superpowers activate when he sees a lady’s underwear. But, when Yuta’s sees skivvies twice in a row, the whole world is destroyed. No, I didn’t mistype that last sentence. 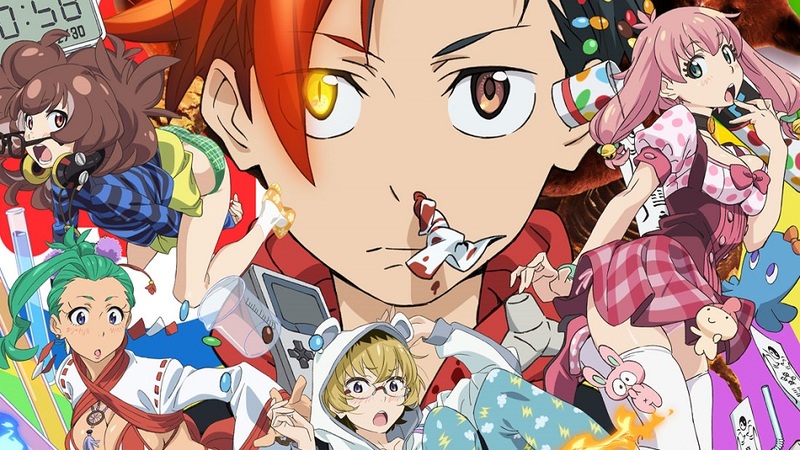 Punch Line is incredibly goofy, but like its namesake, this over-the-top and off-the-wall premise serves as a vehicle to deliver deeper and darker points about keeping secrets, weird experiments, spirit communion, and even time travel. Like a visual novel spin on Capcom’s cult favorite puzzler Ghost Trick, players take on Yuta’s role just as circumstances turn him into – basically – a ghost haunting his own home in search of answers. To get them, he needs to pull pranks on his fellow residents and manipulate them into indirectly solving Yuta’s problems (and saving the world). It’s a big task for a small spirit, especially when ghosts can’t interact much with the world at large. At the beginning, Yuta can only manage to move a small object or two, necessitating the setup of Rube Goldbergian chains of action and reaction that eventually lead to a desired result. One scenario might task Yuta with gaining access to an item inside a locked drawer. Unfortunately, Mikatan, the absent-minded owner of said drawer, has lost the key somewhere else in the building. To attract Mikatan to the room where the key is, Yuta might need to topple a loose salt shaker in a different neighbor’s apartment, prompting that neighbor to bum some salt from Mikatan, thus opening her door and allowing her to notice a little note reminding her to visit the very room where the key lies visible. Putting together these seemingly serendipitous sequences requires a fair amount of trial and error, which is where the time travel comes in. Seeing as the world tends to end whenever Yuta screws up, the rhythm of Punch Line plays out like a hybrid of Ghost Trick and Groundhog Day, with players repeating loops to find the right sequence of triggers. To complicate matters, each trigger costs a certain amount of resources, limiting options and reducing the likelihood that players can just brute-force through the solution. This combination of limited actions and regular logic-based puzzling makes for a surprisingly strategic adventure game. Fans of the show can also look forward to interesting divergences from the canon, along with alternate endings and new insights into older mysteries. Unfortunately, every forward step Punch Line takes in adventuring seems to be accompanied by awkward stumbles backward. Superficially, the game is barely adequate compared to the TV series’ riotously colorful, energetic showcase of 2D animated talent. These 3D graphics fall short, and the character models look drained of dynamism by an oddly “shiny”, plastic-looking approach to shading and stiff, canned loops of motion. The contrast is made more apparent by the liberal use of footage from the show. Punch Line was clearly produced with limited resources, and pales next to some of the fantastic-looking anime titles of the last few years. More damning is the fact that Punch Line’s sense of humor just hasn’t aged well. Rather than take a change in format to emphasize the narrative’s less regressive aspects or highlight the complexities behind the goofball exterior, the game has made the show’s casual voyeurism almost a central mechanic. Exploring spaces for tricks to pull can result in Yuta (and thus the player) staring at his female neighbors’ knickers, at which point the camera magnetizes to the unmentionables. Players must then use the controller to force Yuta’s gaze away, with not just common decency but the fate of the world at stake. Even folks inured to the sleaziest anime tropes may find these inanities detract from the game’s appeal. Players who opt to ignore that stuff still risk being driven away by the stop/start pacing. 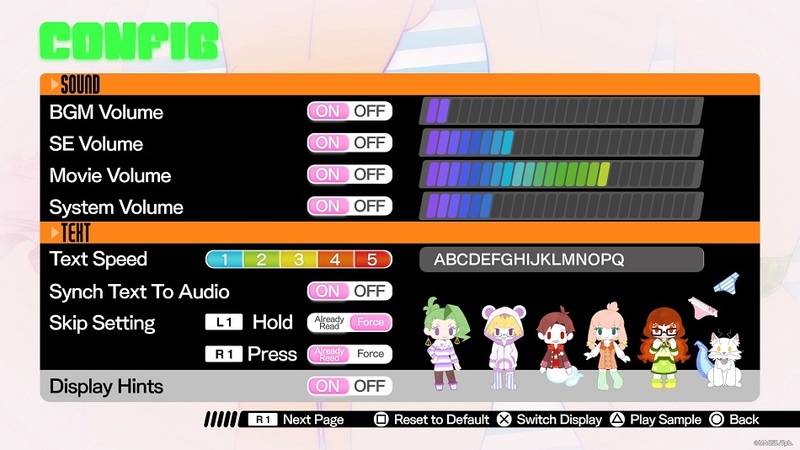 Every time a trick is triggered, the game plays it out in a pre-scripted animation before inexplicably forcing the player to sit through a loading screen while the trick is “cleaned up” and reset. Even some of the gorgeous clips from the show are overused to the point of becoming tiresome. Disclosures: This game is developed by 5pb and published by PQube. It is currently available on PC, PS Vita, and PS4. This copy of the game was obtained via publisher and reviewed on the PS4. Approximately 12 hours of play were devoted to the single-player mode. The game was completed. There are no multiplayer modes. Deaf & Hard of Hearing Gamers: All interaction takes place via text and visual interface elements. All dialog is in Japanese with English subtitles. There are no audio cues necessary for play. This game is fully accessible. 999 is the first game in the zero escape trilogy, they aren’t separate franchises.